Some of you may know I used to buy and sell Lego as a hobby. I stopped doing so and after much internal debate I am also selling the one Item I am most proud of owning MISB. I had a weak spot for collectable Star Wars UCS Lego. So when it got cancelled some years back I bought the 10221 at retail price. Now its price almost exploded and this is the time for me to get a nice Return on Investment. 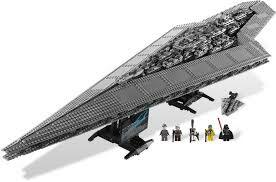 The Super Star Destroyer measures 124.4 cm (50 inches) long and is made of 3152 pieces. This set includes a redesigned IG-88 and Dengar and a new minifigure, Admiral Piett, along with a Darth Vader minifigure. The set features a smaller representation of the bridge featuring the walkway for Darth Vader, the computer panels on either side of the walkway down below where Admiral Piett takes command and the bounty hunters standing by the exit of the bridge. Bossk makes his second appearance to date but his variation remains identical to the one from 8097 Slave I released in 2010. Dengar makes his second appearance to date with his first being in 6209 Slave I. Dengar has been re-designed with extra details. Admiral Piett makes his first and only appearance in this set featuring the same face used for Professor Snape in the 2010 Harry Potter sets. Darth Vader appears in his latest variation for the second time with his first being in 10212 Imperial Shuttle. This variation of Darth Vader features a cartoon like face featuring white pupils and added detail. 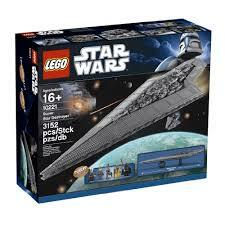 The set also includes a new Palpatine hologram piece which also appears in one other set, 7964 Republic Frigate. The Executor was Darth Vader's personal flagship, serving in the Battle of Hoth, and the subsequent asteroid chase with the Millennium Falcon. The battle over Endor saw the destruction of the massive 19 km ship when Arvel Crynyd, Green Leader, rammed into its bridge in a kamikaze attack when he was hit. The Super Star Destroyer plummeted into the unfinished Death Star, causing enormous damage and killing most of the Galactic Empire's best officers. I am selling this set so I can further finance some hardware I need for my Whisky Hobby. Hope it fetches a nice price. Now that the New Movie "Roque One" is set for later this year it should spark interest in any older vintage Lego Star Wars UCS series sets like this one. I also own a "Slave One" with Jango Fett, but I am still to emotionally attached to that set to part with it! So Bart, from the Scotch test dummies, if you are interested ;) ..